For the longest time, Thaitsuki Nihonto has been somewhat unpopular among the sword community. Yet as often the case with maligned products, the root cause is not so clear cut and dried - and once someone with "authority" makes a disparaging remark, everyone else echoes the same negative sentiment until anyone who says otherwise will be shouted down.. I must admit that I too have been guilty of echoing the popular sentiment at times - and as you can see from this post I too was dismissive of Thaitsuki.. Sometime afterwards, I had the opportunity to try one of these out for myself, but before I could post it got caught up in the Chaos of relocating to a different country (Japan) and years later stumbled upon the old photos I had taken, the video footage I had shot and my impressions of the Thaitsuki flagship sword, the KTN5 Katana. 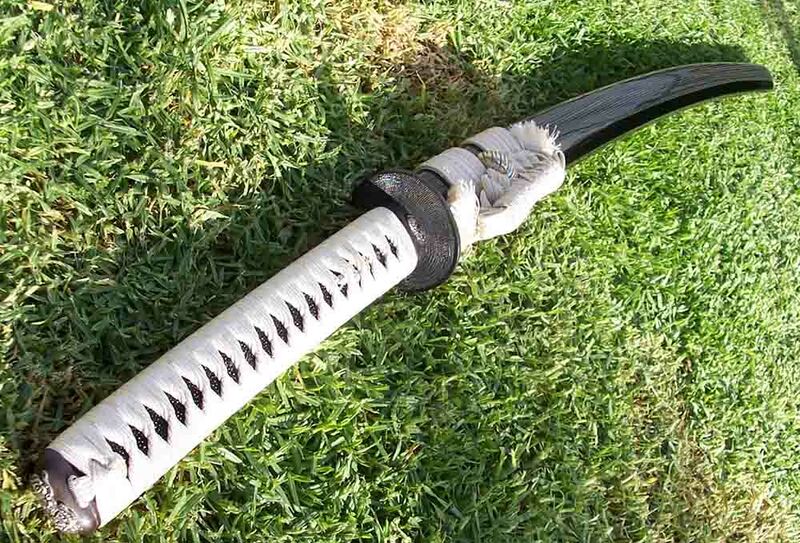 Google "Thaitsuki Nihonto" and you will find the common sentiment regarding these swords is overwhelmingly negative - but digging deeper tends to suggest few people who were disparaging them had actually ever owned one.. Indeed, the main source of the hostility stemmed from a few photo-less reviews (and as they say, "no pics, it never happened!") and, basically, a problem of semantics. 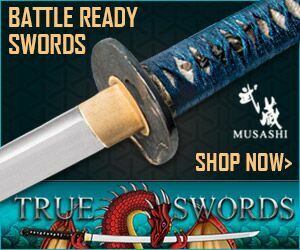 Specifically the company, which is based in Thailand, uses the word "Nihonto" in it's title - a big "No, no" - simply because the word Nihonto means "swords made in Japan", which clearly these Thai produced blades are not.. Naturally, this misuse of the word Nihonto (giving the owners the benefit of the doubt, is probably unintentionally misleading - as the use of the pre-fix "Thaitsuki" clearly refers to their place of origin) upsets a lot of purists. 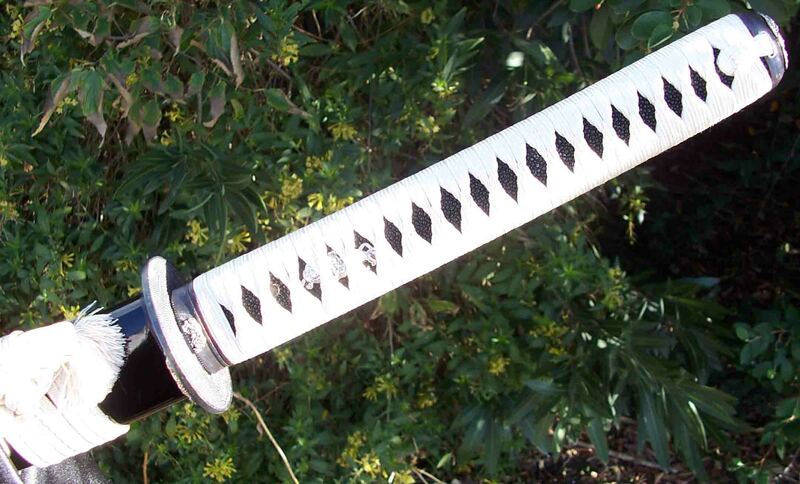 It is a word reserved ONLY for Katana made by government regulated national treasure sword smiths in Japan - whose production is STRICTLY regulated and whose price tags typically START at the $20,000 price point and go up (and up and up!) from there..
Clearly to some people, a rose by any other name does not always smell as sweet..
And with so much unclear and buried in old forum posts dating back to 2004 and earlier, the time had come to put the name aside - because even a cursory glance at the user submitted posts on SBG showed - quite a few people who claimed to actually own Thaitsuki swords and were very happy with what they received. Aesthetically, the Thaitsuki KTN5 is an appealing and attractive package. Everything was tightly assembled, no saya rattle, no loose parts and good looking, quality components. I especially liked the white silk ito wrap on black rayskin - minimalist but attractive, with the contrast especially striking. Apparently the ito is imported from Japan - I don't have any reason to doubt it as it definitely quality material..
As you can see from the photo above, the tsuka is a little on the thick side but with subtle curvature - and most importantly - felt comfortable and secure in the hand. While very tightly wrapped (it does not move in the slightest), close examination reveals the ito wrap is NOT alternating. Not a deal breaker, but not traditional either and not as durable in the long term as an alternating wrap is. Still, as I said, it was very tight and the diamonds, while small, were quite even - though not done using Hishigami paper triangles (used to ensure the diamonds are perfectly shaped). I did not the tiniest wiggle in the Kashira end cap, suggesting at least it has not been glued in place, which is not really acceptable on swords at and abpve the $1,000 price point, though common on those below so I felt that it is unlikely to come apart anytime soon. 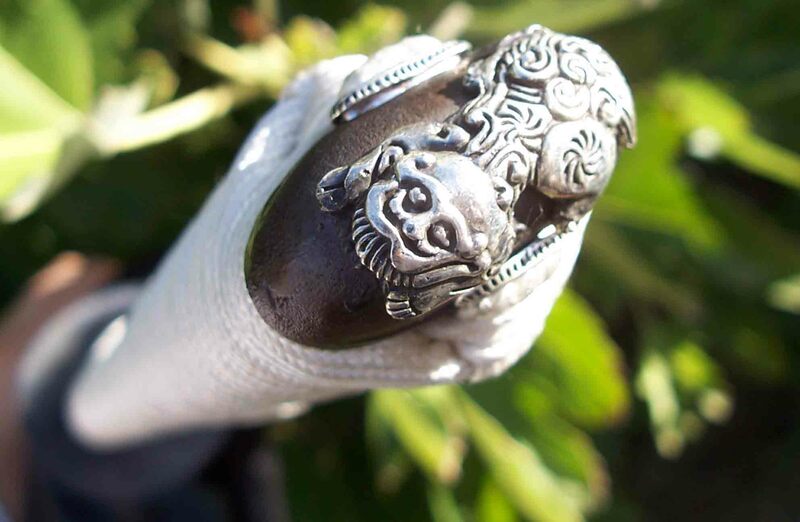 The Lion Dog theme continues throughout the fittings, appearing here on the blackened brass, silver plated Kashira. And again on the Fuchi and underside of the tsuba (the side that faces the swordsman). The tsuba is, like the other fittings, made from Brass and you can see some of the natural color under the blackened finish. 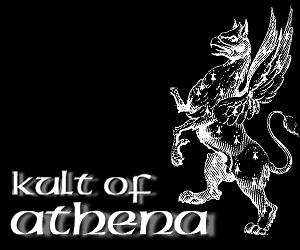 It all feels very solid, and the Lion dogs are very nicely executed. The only thing I am not sure if I like or not is the "record" like pattern. It is traditional, and adds some texture, but maybe this is just a personal thing. Overall, I do like the tsuka fittings - they fit together very nicely, and it is apparent that the quality control is quite stringent - though of course it SHOULD be stringent on a sword at this price point. The Saya feels quite substantial, the wood is thick and quite heavy and it has a very nicely applied lacquer giving it a vibrant, glossy sheen. 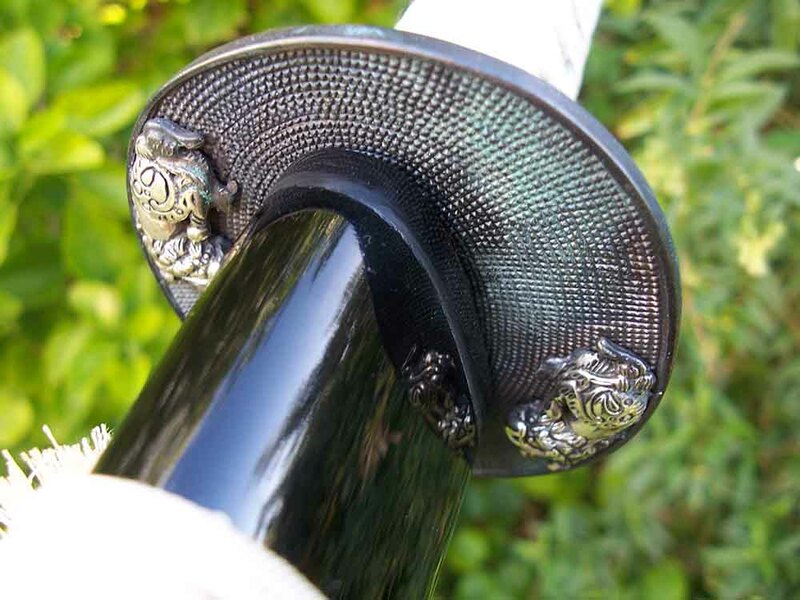 Thaitsuki did a nice job assembling this sword - the fit is pretty much perfect, reinforced with buffalo horn koiguchi and kojiri and the most striking visual features are the thick white silk Sageo and the somewhat ornate silver kurigata. 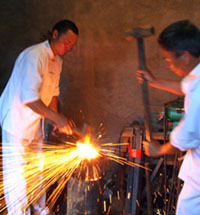 Overall, the quality of the fittings is exceptional and the designs unique. 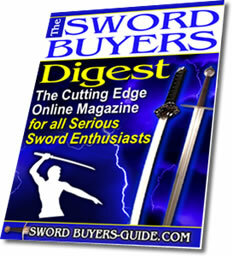 But did the quality carry across to the most important part of any sword, the blade? Read on and see.. 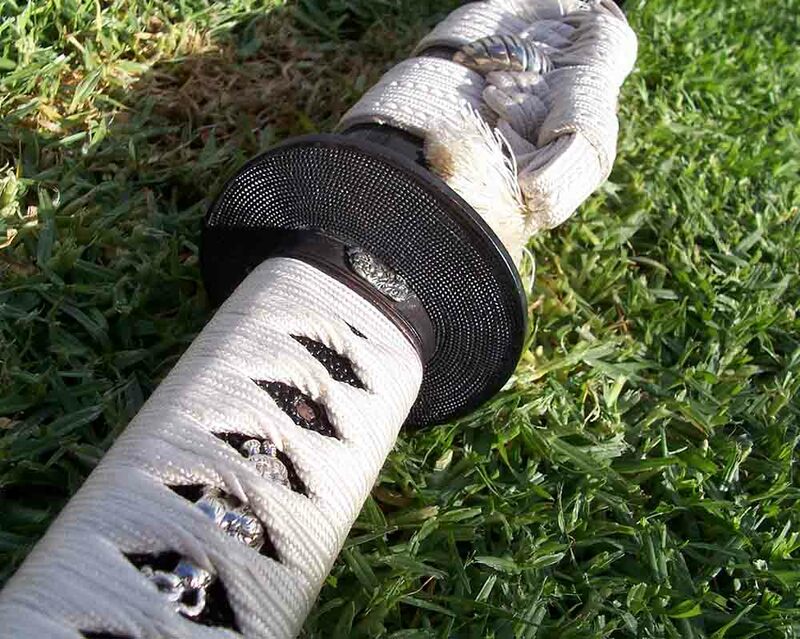 The first thing I noticed, and really liked, about the blade was the short fuller and the silver habaki blade collar. 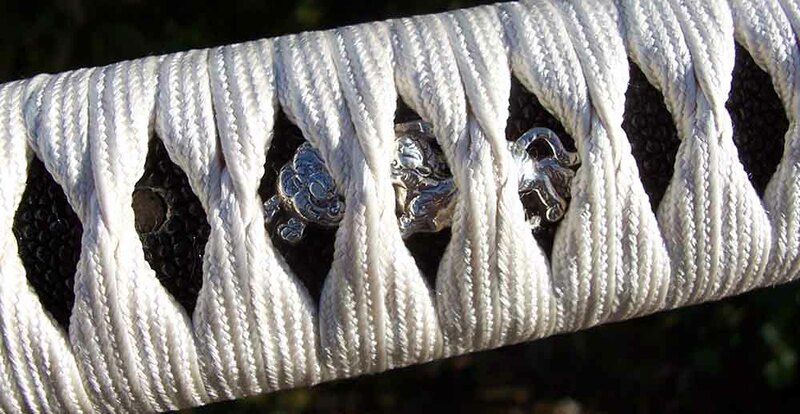 Silver really is a nice choice for a habaki, and the Thaitsuki Nihonto "mon" symbol, while usually undesirable on a sword, because it is a traditional Japanese design, actually looks good and gives the habaki some extra detail. 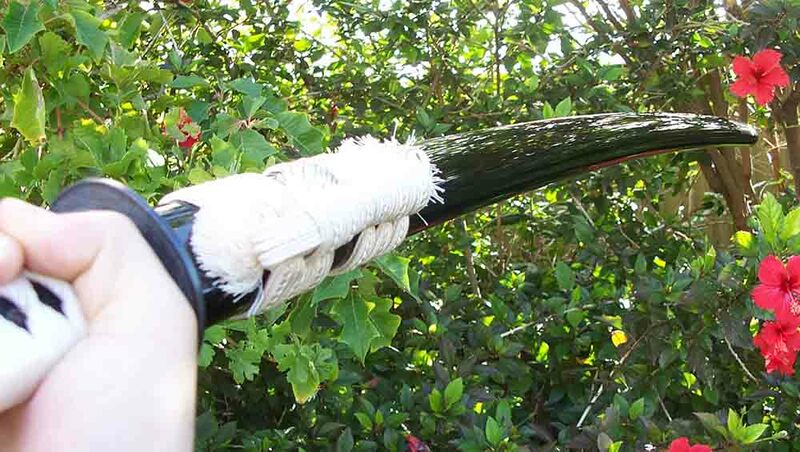 But the fuller was of some real interest - usually a bo-hi goes almost the full length of the blade. But as you can see, this model is a bit different. 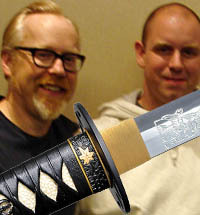 Instead, it extends from under the habaki to about a third of the blade, and while it makes no noise when the sword goes through the air, it changes the balance - and in a good way, to just 5" from the tsuka, which on a 2.5lb blade, seems to lighten it in such a way that the balance shifts towards the tip ever so subtly.. 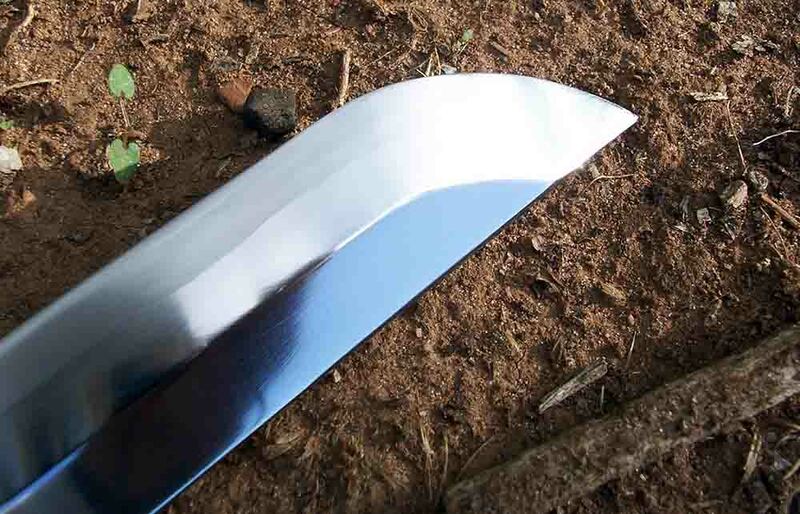 The end result is a blade that really feels like it wants to cut - it is not super fast or responsive, but when it moves - it feels, serious..
Thaitsuki do not specify what type of steel the blade is made from, but only that it is differentially hardened with a HRC of 60 at the edge and 35HRC at the spine. 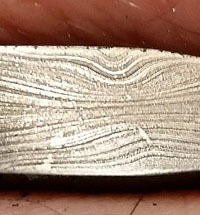 The blade is well polished and the hamon resulting from the differential hardening very clear and well defined. It has chu kissaki and while I did not photograph it very well, also has a geometric yokote. 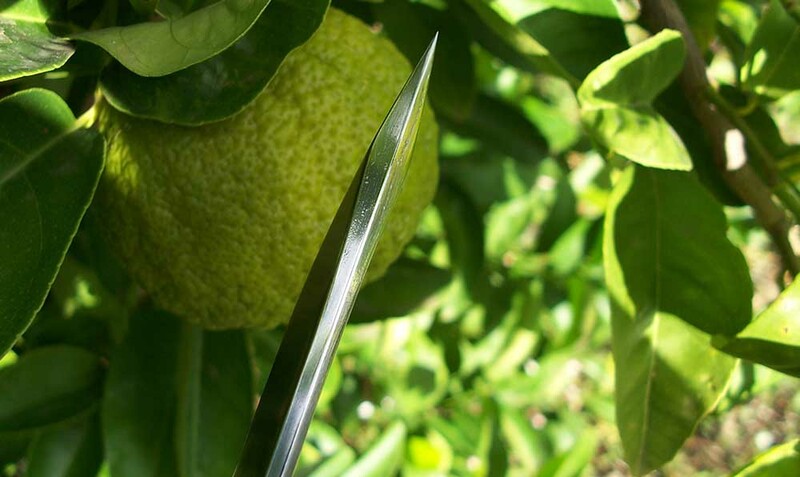 Looking at it from above, you can see the kissaki has a nice diamond shape to it and is wickedly pointed, making it at home both cutting with the tip and thrusting deep into a target. As I mentioned, the edge is extremely keenly honed. Paper cutting tests saw it cut cleanly and easily every time along the entire length of the blade, and it was apparent that the polishers had done their job well. This impression was reinforced when cutting water filled bottles and tatami. Water bottles fell easily before this blade, and tatami mats, both full and half wrap, also seemed to peel away into two pieces on almost every stroke. You can see the video below, only one cut was less than perfect but I think it was my poor technique and the entry of the cutting angle on an upward cut. You can see quite clearly the way the mat falls away from downward diagonal cuts that whatever went wrong on the upwards cut was almost certainly operator error and not a problem with the sword itself..
As this was a "lost" review I was unable to find some mild destructive testing I did with the sword on some shrubbery. These tests were done mostly to see if the blade would be scratched or bent - and neither event occurred. This suggests that the steel is not soft and overall well tempered, but since I cannot find the video to prove it, that is about all I can say on the subject. 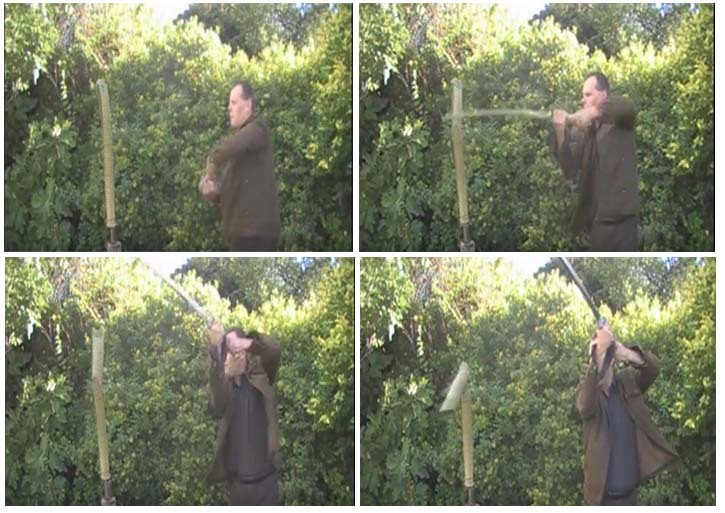 Generally speaking, differentially hardened katana do not take well to abuse as the softer spine and the harder edge can cause it to easily take a set if struck laterally. I would not advise heavy destructive testing due to the nature of such Katana (putting nasty bends in the $2000 Chris Zhou Yasha Katana convinced me of the folly of this) but because the blade is quite thick and the steel seemingly well tempered and hard, I imagine you would have to really screw up to give this blade a set cutting normal everyday targets. 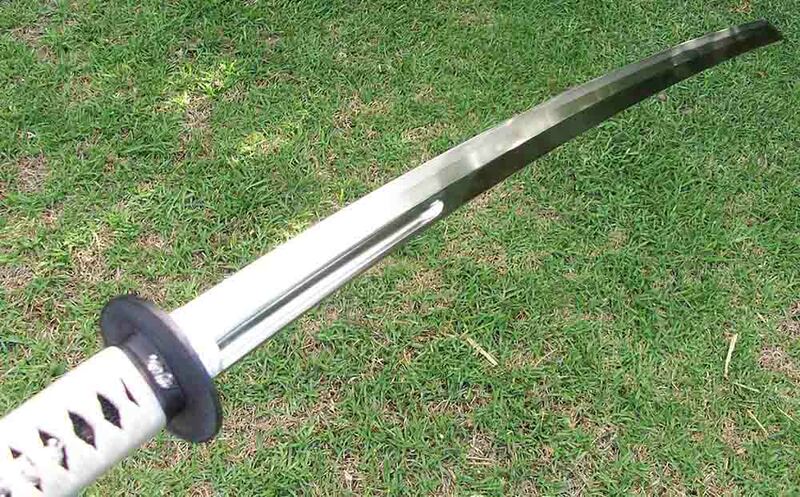 All in all, the Thaitsuki KTN5 Katana is a very nice piece. The fittings are unique and well executed. I love the heavy use of silver, which is quite abundant in Thailand, and the white on black theme is elegantly simple - though on the downside may tend to show dirt and staining more readily than darker themed swords. Yes, there were a few minor complaints here and there and things that could - and probably should - be done better for a sword at this price point. 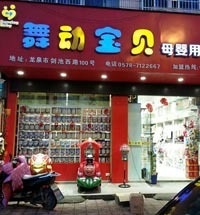 But overall, the pros outweigh the cons, and I really do feel that Thaitsuki have an undeservedly bad reputation. 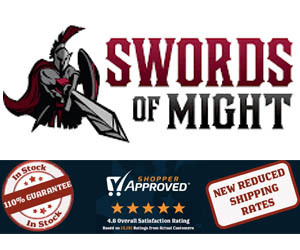 Are there better swords available at this price point? 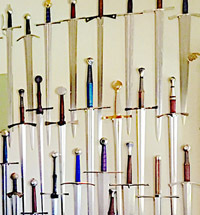 I would have to say, yes - there are, but not so much that this sword does not become a valid option to choose from for the high end collector - especially those that like a somewhat fierce cutting blade with a unique look that no-other sword has. Is it worth the price tag? Well, yes and no.. 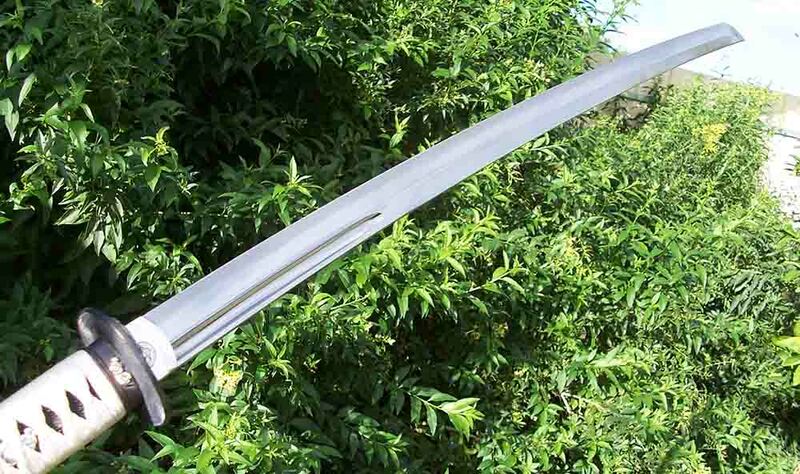 It is a little on the expensive side for a sword that is essentially fairly simple. The blade is very good, but I have seen better for less money. The fittings are really good quality, but there are some minor issues with the construction such as the somewhat bulky tsuka and non-alternating ito that bump it back a notch lower than what you would expect for the price tag. However, the overall cutting performance and the quality of the fittings themselves suggest that if it is overpriced, it is not by all that much, and as I personally love the way it all comes together, I would not hesitate to buy it again. 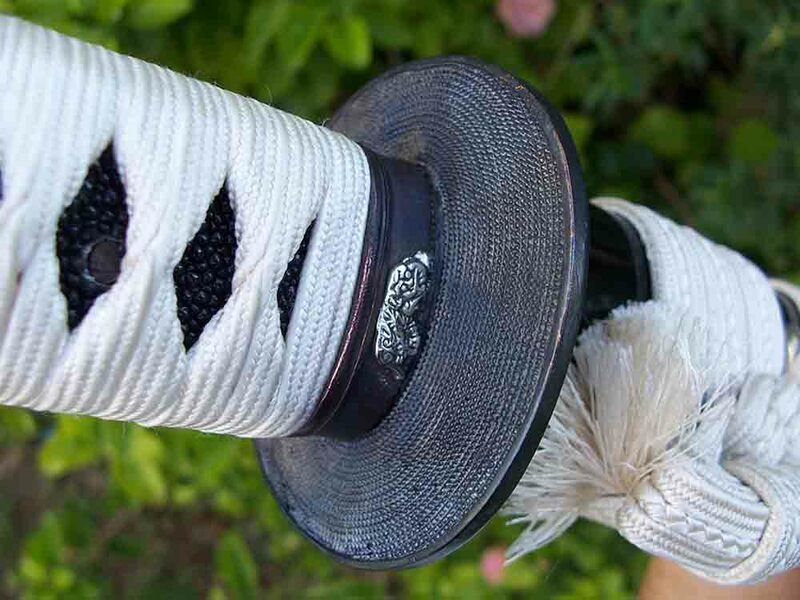 High quality Japanese silk ito and hard wearing sageo. Decent polish with very keen edge. Very defined natural hamon with boshi and yokote. Powerful cutting action and the feeling of a very strong, aggressive sword. The MSRP on this sword is $1,900 - which is, I feel, most definitely too high for this particular piece. 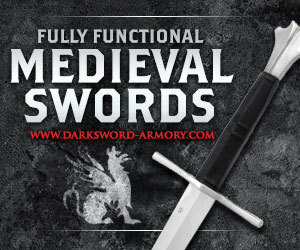 However, one of our top recommended sword vendors and the company that owns the master distribution rights to this brand sells the entire line up at 30% or more less than MSRP and stand behind the products 100%. 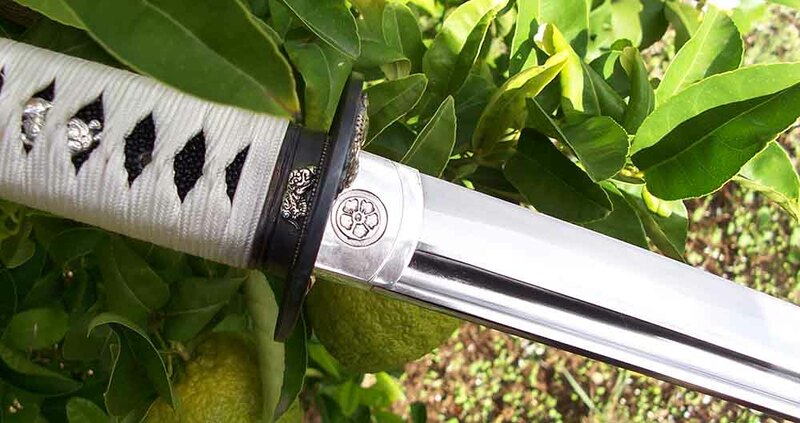 I am talking of course about Japanese Swords 4 Samurai - which list the KTN5 here for $1349, which is the lowest price online. 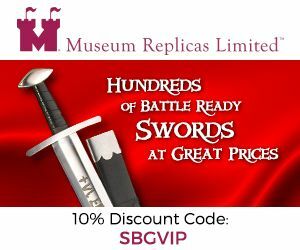 I am not 100% certain that every sword in the line up is as good as the KTN5, but if this sword is representative, they are definitely worth a closer look.